The class is part of Sydney Theatre Company’s School Drama™ program at Whalan Public School. The school is a diverse and vibrant community: 32% of students have language backgrounds other than English and 21% of students identify as Aboriginal and/or Torres Strait Islander. 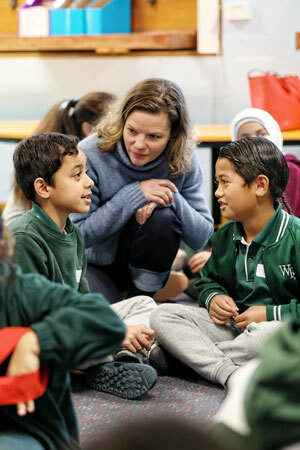 A Priority School with STC since 2016, Whalan Public School is part of an ongoing initiative designed to improve access to theatre and drama experiences for primary and secondary schools in Western Sydney. The Priority Schools Program is enabled by the generosity of STC’s donors. On this particular day, actor and STC Teaching Artist Georgia Adamson is working with classroom teacher Nerida Bryce, exploring how drama strategies and quality literature can be used in the classroom to improve student literacy. When the 7-week program concludes, Nerida will have the confidence and capacity to integrate drama strategies into her regular teaching practice. Claire Garland, a teacher at Whalan Public School, also participated in the program. 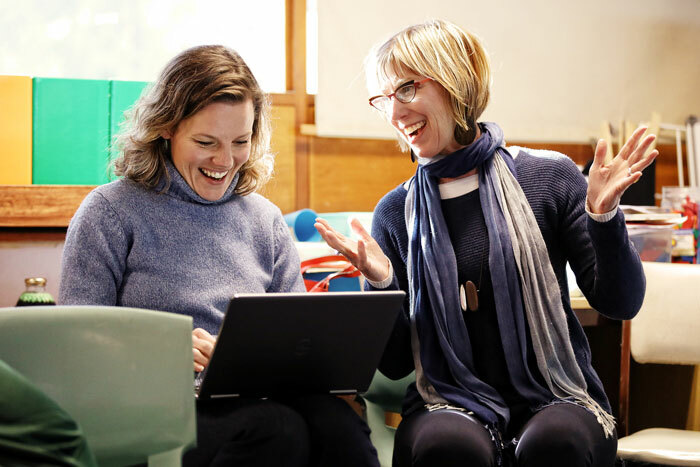 “What’s really struck me is how the students connect the texts to themselves… it’s drawing out some introverted students by allowing them to make personal connections,” says Claire. Established in 2009, School Drama is a collaboration between Sydney Theatre Company and The University of Sydney. The program has since expanded to Albury-Wodonga, Darwin, Brisbane, Melbourne and Canberra. Over 22,000 students and teachers have participated in the program. Teaching Artist and actor Georgia Adamson has worked on the program for several years and is a passionate advocate for using drama in the classroom. “Working on this program has broadened my sense of what it means to be an actor, that the way we work with story, communication and expression is something that can be extended and celebrated well beyond the confines of a theatre or set. And that’s a wonderful thing!” says Georgia.